It's not just some old wives tale your Granny used to waffle on about. Nor some kind of witchy cleverness. Elderberries are in fact an easily accessible, locally growing Superfood! Well local if you live, like me, in Ireland. They are also prolific in the UK, and grow across North America and Europe. I don't know if Elder grows in Australia or anywhere else in the world not mentioned. And there are hundreds, if not thousands, of varieties. Many people years ago took a glass of Elderberry & Clove Cordial/Syrup, that they had gathered and made themselves, every day. This kept colds and flu at bay, and if you did contract something like this, it would only last a couple of days and be less severe. "In 1992, a team of Israeli scientists studied the effect of elderberry on flu patients. 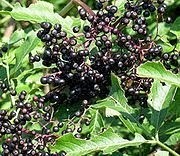 During a flu epidemic, half of their patients were given an elderberry syrup, the other half a placebo. The results: within 24 hours, 20% of the patients receiving elderberry had gotten significantly better. Within two days, 75% of the elderberry group were much improved; within 3 days 90% were completely cured. Among the placebo group, only 8% of patients improved within 24 hours and it was a full 6 days before 90% of the patients were cured." "Studies have even shown that elderberry worked better than prescription remedies such as Tamiflu and Relenza. Take that, Big Pharma!"